I have a lot of left-over Halloween candy, so it occurred to me - why pay for more sugar (Gatorade) when I can just gobble some Halloween goodies? Referencing the information I got from the Velonews FastTalk Podcast, the answer is pretty much "go for it". ... as long as the primary sugar is glucose, not fructose. Fortunately here in Canada, most of our candy is either made from real sugar (sucrose contains 50/50 glucose/fructose), or from glucose/sugar mix (ie. dextrose). In the U.S. it's a bit tougher to find candy not made from high-fructose corn syrup (glucose-fructose), which can contain more fructose than you really want for exercise. 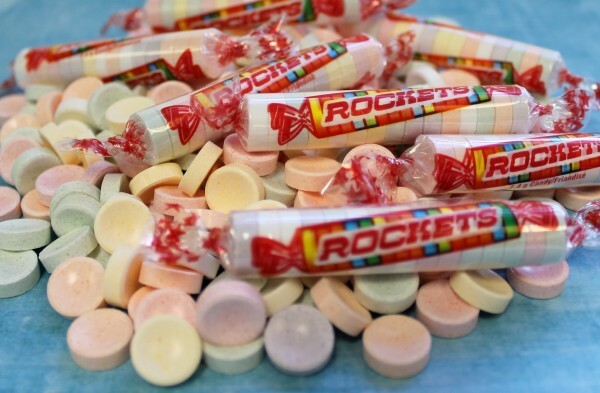 Rockets are one of my favourites (or "Smarties" in the U.S., which are entirely different from our "Smarties" which are made of chocolate!). 30 calories of Dextrose (glucose) goodness per roll. Also Swedish Berries... glucose syrup, yummmm!